See that cake up top? Can you believe that it was made with just one bowl? Okay, that's not true. It was supposed to be just one bowl, and I was supposed to just make one cake to use up all the odd quantities of ingredients I had lying around before I disappeared off to Amsterdam and London (which is where I am right now!). But guess who rushed through the recipe, didn't read all the ingredients properly, and therefore left out one egg and ended up with a soggy, deflated cake? Because this cake is worth it. 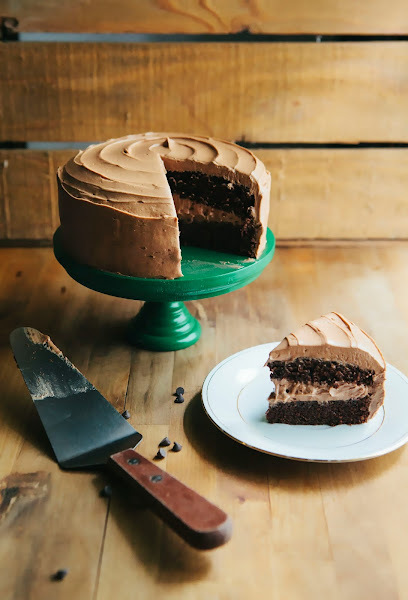 A double layered, incredibly moist chocolate cake topped with buttery, fluffy mocha (that is, chocolate and coffee) buttercream. All made in one bowl, with less than 15 minutes of prep time, because this recipe comes from a book called One Bowl Baking: Simple, From Scratch Recipes for Delicious Desserts. Unlike most baking books with recipes that require a stand mixer or a handheld electric whisk, ALL the recipes in One Bowl Baking require just one bowl. The book's author, Yvonne Ruperti, has some serious foodie cred: she was on America's Test Kitchen for three seasons, and is a recipe developer and writer for Cook's Illustrated and Serious Eats. You can tell from the book — it's filled with a variety of baked goods like layer cakes, cookies, muffins, tarts, cheesecakes and more! To top it all off, almost all recipes come together in 15 minutes or less! This book is definitely a game changer for those without a dishwasher and spend hours hand washing their dishes (ehem, me). The giveaway is only open for 1 week and closes on October 8, 2013 (next Tuesday) at 8:00 PM PDT. At that point, a winner will be chosen at random and notified by email shortly afterwards. Unfortunately, the giveaway is for US residents only. I cannot ship abroad/overseas. You can enter as many times as you want. That is, the more times you enter, the more likely you'll win! I promise you that your contact info will never, EVER be shared or given to anybody else. You will only receive an email from me if you've been chosen as the winner. Sound good to you? Cool! Fill out the form below to be considered for a FREE COPY of One Bowl Baking! THE WINNER WILL BE CONTACTED SHORTLY. CONGRATULATIONS TO KELLY S. FROM TEXAS!!! This makes a small, 6-inch cake, which is smaller than your standard 8- or 9- inch cake. Consider yourself warned; you will want more. You can buy 6-inch cake pans online at Amazon, or any specialty baking store like Sur La Table. I added a layer of mini chocolate chips in the middle frosting layer between the two chocolate cakes; you can omit, but I love the extra texture they add to the cake. 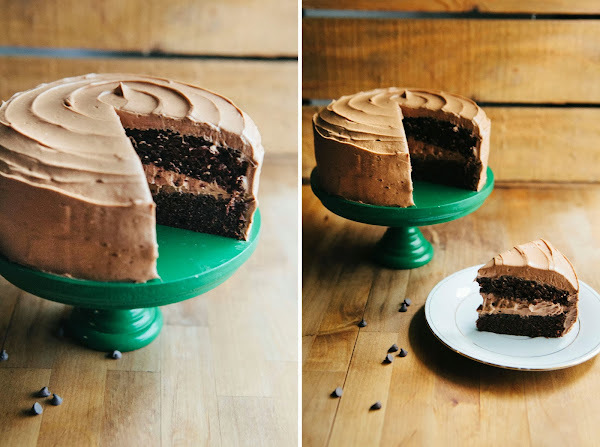 You can substitute with regular chocolate chips as well, but I would halve the recipe quantity because this is a fairly small cake — you don't want to overwhelm the texture. Preheat the oven to 350 (F) and place your oven rack in the center position. Prepare two 6-inch round cake pans by spraying liberally with non-stick cooking spray and line the bottoms of each cake pan with parchment paper. Spray the parchment paper. In a large bowl, whisk together 1/2 cup granulated sugar, 2 tablespoons light brown sugar, 1/2 cup sour cream, 1/3 cup vegetable oil, 1 large egg, 1 teaspoon vanilla extract and 1/4 teaspoon salt until well combined. Add 3/4 cup all-purpose flour, 1/3 cup cocoa powder and 1/2 teaspoon baking soda and continue whisking until the batter is smooth and the dry ingredients have just been incorporated into the wet ingredients. Be careful not to overmix or your cake will be dense and I will cry for you; it's okay to have one or two small flour streaks left in the batter. Transfer the batter into your prepared cake pans and bake until just firm, around 20 to 22 minutes. When the cakes are ready, a skewer inserted into the center of each cake should come out clean and the tops should bounce back when gently poked with a finger. Once the cakes are finished baking, transfer the pans to a wire rack to cool for 15 minutes, before inverting the cakes out of the pans to cool completely before frosting. In a large, heatproof metal bowl, combine 1.5 ounces finely chopped bittersweet chocolate and 1 tablespoon instant coffee or espresso powder. Place the heatproof metal bowl over a saucepan filled with water, making sure that the water does not touch the bottom of the bowl. Melt the chocolate by bringing the water to a boil and constantly stirring the chocolate with a whisk. Once the chocolate is completely melted, whisk in 2 sticks unsalted butter and 2 cups confectioner's sugar, whisking until combined and the mixture has lightened to a pale brown. If too soft to spread, chill the frosting until spreadable, whisking occasionally. If not, use immediately. Place 1 cup of the frosting on top of one cake, using an icing spatula to create an even layer. Sprinkle 1 cup mini chocolate chips on top of the frosting, before nestling the second cake on top of the chocolate chips. Use the remainder of the frosting to frost the cake completely. I'd love to enter but I'm UK based. Your cake looks delicious, I love the thick layer on buttercream in the middle. Yum! This cake looks amazing... perfect with a cold glass of milk! Can't wait to try! Your frosting swirl abilities are making me drool! 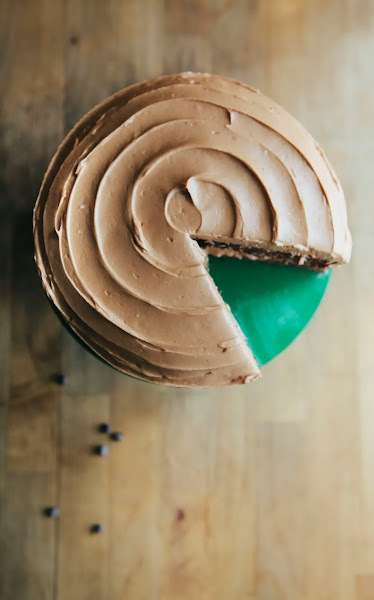 Can you post on your technique for cake assembly/icing? 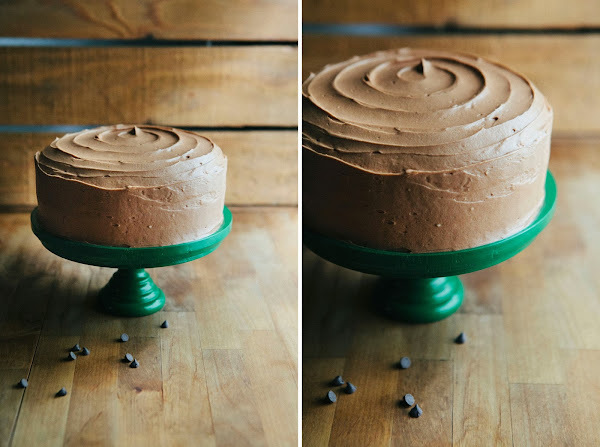 That is such a lovely and simple chocolate cake! Looks so moist and full of chocolate flavor! Oh my, this looks absolutely divine! (Not a word I just throw around willy-nilly, just so you know.) And I agree with Yvonne: you have amazing frosting swirling skills - please share! Oh my!!! Really looks delicious!! The cake looks amazing and I will definitely have to try out this recipe. But even more amazing is that cake stand - where did you get it? Sweet! Not only did you completely sell me on the book, but this frosting looks like so much more yum than the momofuku coffee frosting. Although that cake was so good. Oh I'm craving it now, ugh. Lol I love that you prioritized cake before packing!! Priorities shmiorities. Beautiful , delicious - but I could tell even before baking it that the volume of batter would be way too much for two six inch layers. Not that this is a problem - just be prepared with an extra pan on hand. Instead of mini chips, I chopped an espresso crunch chocolate bar ( Divine Chocolates make a nice one if you can find it) and used that between the layers and to decorate the cake. 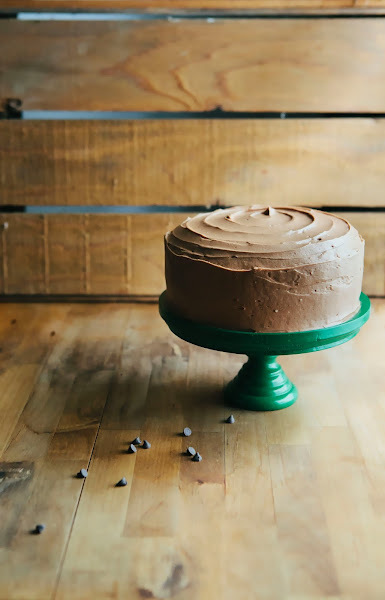 About the Mocha Buttercream... Do you whisk in the butter and icing sugar while the chocolate and espresso are still warm (and on the boiler) or do you take the chocolate off and let the mixture cool a bit before adding the butter and icing sugar? Just hoping for a little clarification on the exact steps. Thanks! I am excited to make this! Sorry for the confusion! I took the pot of chocolate off its heat source and let it sit for a minute, stirring it gently to release some heat. I then added the butter and sugar. Hope that helps! I was wondering how many people this cake would serve? I'm having a party and I'm wondering if I should double it. Thanks! Hi there, I think this would probably serve 6-8 people. This is really a wonderful website with lot of cool information. Hey thanks for the great recipe this looks amazing I will definitely be making this. I was just wondering if this buttercream will crust? Hi there, the buttercream does indeed crust! The batter for these cakes was SUPER THICK. I think I measured everything correctly and tried to stop before over-mixing things, but it turned out so thick. I had to smear it into the cake pans and all the lumpy surface ripples in the batter were still there after the cakes baked. They turned out very dense and short. I don't know if this is how they were supposed to be or if I messed something up. I probably won't use the cake recipe again, but the icing recipe was delicious. That part of this is definitely a keeper. Doh! I just reviewed the ingredients again. I used baking powder instead of baking soda. I imagine that is why the cakes did not rise.